This lady’s husband had responded to Mark Marx’s offer of prayer for healing by saying his wife needed some. This was on the National Gallery’s concourse in Trafalgar Square, London. As she sat down, three or four ladies came and knelt around to pray in Jesus’ name. Within minutes she was feeling much better and ‘hubby’ took his turn. Meanwhile, their son was chatting to Mark and both were amused to learn they were from the same town in Northern Ireland! His parents were visiting him whilst he’s temporarily working in London. Afterwards, all four were encouraged by yet another amusing way the Living God looks after us personally. Mark had gone to Coleraine and started Healing On The Streets (HOTS) there at Easter 2005. Since then, churches across the town had met every Saturday to pray for anyone who needed healing – and met with great success! In view of my involvement earlier this year with HOTS-Bath against the advertising standards’ dictat (see HOTS and ASA tags), as well as our experience in Christian prayer ministry, Nina and I booked a day under the wing of its founder, Mark. As he admitted, it would be a long, intense day of being crammed with teaching and then putting it into practice! Mark was back at home in this London church from where he’d ‘cut his teeth’ on the streets of Soho, part of the West End’s night entertainment and festivities area. There, he found how marvellously Jesus heals even unbelievers when his team prayed for a Chinese waiter’s loss of hearing. This sense was vital for taking customers’ orders but he’d mis-heard that of a friend of his boss! So there was a serious threat of his losing his job. Within minutes of being prayed for this waiter’s ears were healed and he went away very happy – but then got stopped by a gang of triads who’d been watching every-thing from the side. Their leader approached Mark and threatened to deal with them! First, however, he’d put them to a test – he had a bad lung problem. It got completely cleared, so all of them really did praise the Lord! More recently, Mark was teaching 114 church leaders at Birmingham University and their ‘field’ was the nearby public open area. But this was the haunt of hundreds of Goths decked out and decorated in their morose black gear. The church leaders were most unsure about this! But the Goths ‘flocked’ to receive prayer, one lot even sitting three-high on a chair because the demand was so great! And of course they wanted to learn about Jesus! So what does Mark teach and is it different to prayers in church? Click to continue. 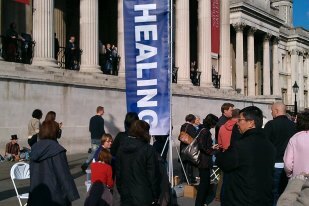 This entry was posted in Healing, Personal and tagged HOTS, London by Richard Barker. Bookmark the permalink.